Prefontaine (film) The inspiring true-life story of an incomparable athlete who attained greatness, challenged defeat, and transformed adversity into personal triumph. From early childhood, the handsome, charismatic, brash, “Pre”–as he was affectionately known throughout his life–was filled with determination to succeed at the highest level no matter the odds. He began distance running in his home state in high school and at the University of Oregon, and gained worldwide popularity with his participation in the 1972 Munich Olympics. Losing a race there, he became an activist, championing rights for sports figures. And though his life was tragically cut short, at age 24, in a car accident in 1975, Steve Prefontaine not only became a sports legend, but he also changed the sport of distance running forever. A Hollywood Pictures film. Directed by Steve James. Limited release on January 24, 1997. 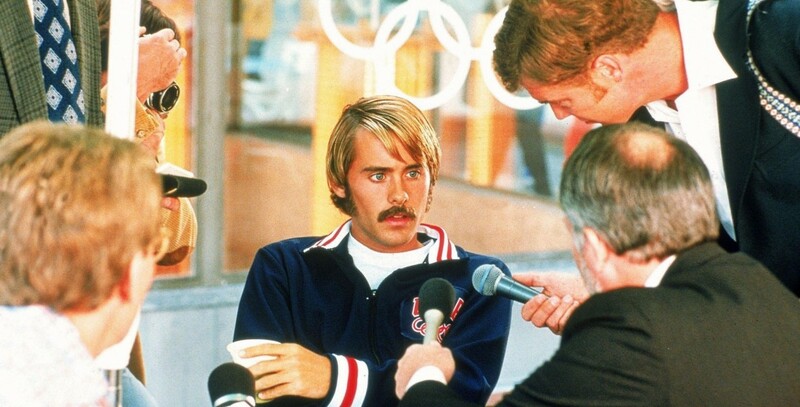 Stars Jared Leto (Steve Prefontaine), R. Lee Ermey (Coach Bill Bowerman), Ed O’Neill (Bill Dellinger), Breckin Meyer (Pat Tyson), Lindsay Crouse (Elfriede Prefontaine), Amy Locane (Nancy Alleman). 106 min. Some of the members of the production company had worked on an award-winning Steve Prefontaine documentary, Fire on the Track, which aired on CBS in 1995. For the feature film, the producers decided to photograph it in Super 16mm film stock, designed to be enlarged to 35mm for theatrical exhibition, in order to give it a documentary feel, and to employ intercut interviews. The locale selected for the filming was Seattle and its environs. Released on video in 1997.